1.1.2 Can I use a smartphone to see live cams on Stripchat? 1.1.3 How many types of users exist? 1.1.4 Why do I need tokens? 1.1.6 Whom are the Knights ? 1.1.7 Who is the King ? 1.1.8 What is Private Chat? 1.1.9 What is Cam2Cam Show? 1.1.10 What is Spy Chat? 1.1.11 How can I chat Privately with a Model? 1.1.12 What happens when I subscribe to "Notify when online" in a model's room? 1.1.13 What are the Stripchat rules? 1.1.14 How can I recover my password? 1.1.15 I forgot my username, how can I get it? 1.1.16 Can I change my username? 1.1.17 How can I delete my account? 1.1.18 I had an unsatisfactory Private or Cam2Cam show, what can I do? 1.1.19 Where can I report a problem involving a model? 1.1.20 If a model blocks me, how can I get unblocked? 1.1.21 If a Knight mutes me, how can I get unmutted? 1.2.1 What is a Token and how much does it cost? 1.2.2 What do I do if my transaction has been declined? 1.2.3 I purchased tokens but they haven't shown up in my account yet, why? 1.2.4 How much of my tokens go to the model? 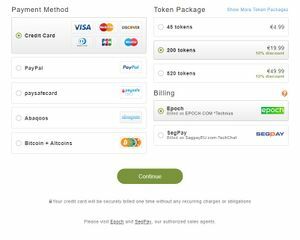 1.2.5 Can I buy tokens without a credit/debit card? 1.2.6 What will appear on my credit card statement? 1.2.7 My purchase dates do not match those of the charges on my bank statement. Why is that? 1.2.8 Is my Personal information safe at Stripchat? 1.3.1 Someone sent me spam via Public Chat, what should I do? 1.3.2 Someone is harassing me, what should I do? 1.4.1 I'm experiencing difficulties watching live streams, what should I do? 1.4.2 I can't log in. What is the issue? 1.4.3 How can I enable cookies? 1.4.4 I have no sound. How can I fix it? Stripchat is a free online community where you can watch amazing amateur models perform live. Stripchat is 100% free and it provides instant access to everybody! Can I use a smartphone to see live cams on Stripchat? Yes, Stripchat can be accessed from all kinds of smart phones just like from laptops and PCs. Open your browser on your smart phone and type in Stripchat.com in the URL section. Wait for the website to load in and enjoy thousands of models performing live wherever you are in the world. How many types of users exist? When you create your free account on Stripchat.com, you automatically become a grey user (a user with no tokens in his/her account). You can become a green user by adding any token package to your account, which will definitely help you get attention in a model's room. Furthermore, as a green user, you cannot get muted by any of the “Knights”. When your account has no tokens available you'll be shown as an ex-green user, so models and other users know that you're an active member of the community. The top user level comes with Gold membership. Becoming a gold member grants premium advantages and unlocks many features that no other type of user has. You can send and receive unlimited Private Messages to models at no charge, you can change your status to "invisible" so you can sneak in different chat rooms, and you'll also receive insane discounts on token packages when promotions are available. Why do I need tokens? Tokens are a form of online currency. Once you buy your first token package, you become a green user. If you run out of tokens, you'll be shown as an ex-green user instead of a grey user. You can buy tokens to tip models, enter Private Shows or enter Cam2Cam shows, purchase exclusive photos and videos from your favorite performers. Even though tipping is not required, users can show their appreciation for a model's show by sending them tips. Models usually will not respond to members who make special requests without tipping. By clicking "add to Favorites" models are automatically saved and stored to your “favorites list” so you could have easy access to their shows later. See the favorites menu here: https://stripchat.com/favorites Your favorite performers will always show up in the top rows of the site for easy access. Whom are the Knights ? The King represents the highest tipper within the last 12 hours of broadcasting. Private Chat represents the way to communicate with the model privately. In order to start a Private Chat with the model, all you need to do is to press the button “Start Private”. Please be advised that during the session, you can have spies, however, they will not be able to communicate directly with the model. The Show can be stopped at any time either by the user or the model, and it stops automatically when the user runs out of tokens. The default price is 24 tokens/ minute and it can go up to 120 tokens, depending on the model’s choices / settings. Cam2Cam Show represents the way to communicate with the model face-to-face. This means that during this session, the user can turn on his / her webcam and be seen by the model. In order to start a Cam2Cam Show, all you need is to press the button “Cam2Cam”. During this Show, nobody can spy. It can be stopped at any time either by the model or the user, and it stops automatically when the user runs out of tokens. The default price is 32 tokens/ minute and it can rise up to 120 tokens, depending on the model’s preferences. 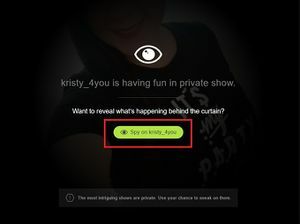 Spy Chat allows the users to see what is happening during a Private Show. The Spies cannot chat directly with the model while sneaking in. They can only passively watch the show that is performed during that session. The default price for Spy Chat is 8 tokens/ minute but it can raise up to 12 tokens/minute, depending on the model’s preferences. How can I chat Privately with a Model? Only Gold members have the privilege to send private messages to any model they would like to at any time. All you need to do is click on the envelop icon on the left of the model’s video and you are ready to start chatting with the model privately as long as you are not banned by the model. Members that are banned by the model cannot interact with her anymore. To become a Gold member you need to buy the GOLD membership. What happens when I subscribe to "Notify when online" in a model's room? Subscibe to a model with "Notify when online"
By clicking "Notify When Online" you are subscribing to a model's notifications and updates. This means that when a model comes online or sends you a message, you'll receive an email and push notification so you will never miss anything regarding her activities. You can enable or disable push notifications in your profile "Settings and Privacy" tab anytime. What are the Stripchat rules? Use https://stripchat.com/forgot-password to restore your password. 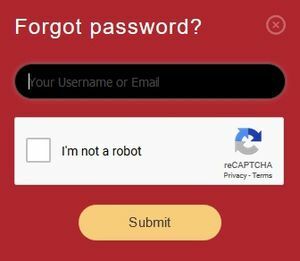 I forgot my username, how can I get it? Log into your account, then go to https://stripchat.com/settings. Click on Delete My Account, write the explanation, select the checkbox "I confirm that I want to delete my account" and click on "Delete". I had an unsatisfactory Private or Cam2Cam show, what can I do? After every show you have the ability to rate it. Select the rating that you feel is appropriate for the show. Add an explanation and we will help you resolve the issue. Where can I report a problem involving a model? If a model blocks me, how can I get unblocked? The decision to block a user is completely up to the model. Users can not be unblocked without the model's permission. If a Knight mutes me, how can I get unmutted? Knights only have the power to mute grey users. So if you're a grey user that gets muted from a model's room, you have to wait 24 hours to be able to chat again to the model’s room. However, if you become a Green or Gold user, you cannot ever be muted by any of the Knights. Otherwise, if you stay grey, you'll always have the potential of getting muted for 24 hours from a model's room. Tokens are a form of online currency. Once you buy your first token package, you become a Green user. You can buy tokens to tip models, enter Private Shows or enter Cam2Cam shows. Even though tipping is not required, users can show their appreciation for a model's show by sending them tips. Models usually will not respond to members who make special requests without tipping. You can purchase tokens in various ways and packages, the bigger the package the more bang for your bucks. We have many more alternative payment options according to your country. Please check on the site for available payment methods Below are some of the main payment methods we offer. There are many more alternative payment options for specified countries, which you can find on the website. We are constantly adding more and more to make payments as easy as possible. Your credit card will be securely billed one time without any recurring charges or obligations. Also, please be aware that US prepaid debit cards will be declined due to the card’s international billing limitation. How much of my tokens go to the model? Models get 50% of the tokens earned unlike other websites which pay their models less than 20% which is unacceptable for our standards since our models’ and members’ satisfaction are our top priorities. We want to keep our customers satisfied and protect their privacy. For these reasons, all the transactions will appear under CentroBill, Technius Ltd or EPOCH. Is my Personal information safe at Stripchat? Here at Stripchat we keep our users secure and their private data safe. We use https to be sure our website and billing system is secure and meets all the international online security standards and requirements. Someone sent me spam via Public Chat, what should I do? Please report the spammer by contacting us. Someone is harassing me, what should I do? 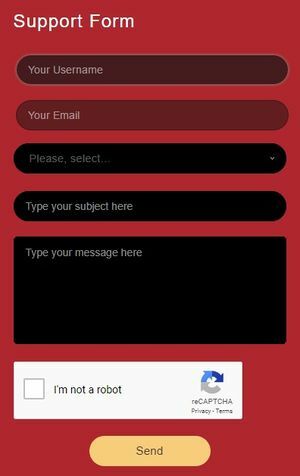 Please take screenshots of the harassment and contact us. Make sure to provide us with as much supporting evidence as you can. I'm experiencing difficulties watching live streams, what should I do? I can't log in. What is the issue? Please check the sound button in the top left corner of the model's cam panel. Don't forget that you also have a system volume button, in Windows it is on the bottom right in the system tray. For Mac users you can find it at: System Preferences -> Sound -> Output Volume. Please note that sometimes the model may be experiencing technical problems on her side. If that is not the issue please send us a report about your sound problem with as many details as possible. By any chance if you wish to delete your account, please click on your account button and go to Settings and Privacy menu point, then click on the Delete My Account button. Please fill out the query form why you have made this decision. This information is very important to us so we can keep working on improving our website and services. This page was last edited on 15 October 2018, at 12:14.